If you don't see the Text Highlight Color button on the Home tab of the Ribbon, read Requirements below for more details. On the Home tab, select the arrow next to Text Highlight Color . Choose a color. 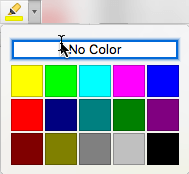 The text you selected will be highlighted in the color you chose. With no text selected on the slide, on the Home tab, select the arrow next to Text Highlight Color . Choose a color, and then move the mouse pointer over the text area of your slide. The mouse pointer changes to a highlighter. . Select each portion of text that you want to highlight. When you're done highlighting, press Esc on the keyboard to turn off the highlighter. On the Home tab, select the arrow next to Text Highlight Color and click No Color.